Groen, Amy H. 2005. Yucca glauca. In: Fire Effects Information System, [Online]. U.S. Department of Agriculture, Forest Service, Rocky Mountain Research Station, Fire Sciences Laboratory (Producer). Available: https://www.fs.fed.us/database/feis/plants/shrub/yucgla/all.html . Throughout this review, soapweed yucca refers to all varieties of Y. glauca. A distinction between the varieties will only be made in the Distribution and occurrence section. The Flora of North America  does not recognize soapweed yucca varieties. Hybrids: Soapweed yucca hybridizes with soaptree yucca (Y. elata) in eastern Colorado, central New Mexico, and Arizona [160,161]. Soapweed yucca is also believed to hybridize with Buckley's yucca (Y. constricta), Navajo yucca (Y. baileyi), and narrowleaf yucca (Y. angustissima) . Soapweed yucca is listed as imperiled in Missouri . Soapweed yucca is one of the most widespread of all the yuccas . Its range extends throughout most of the Great Plains, from Alberta to southeastern New Mexico and the Texas panhandle, and east into Iowa and Arkansas [57,137,151]. Distribution of narrowleaf yucca encompasses the entire range of soapweed yucca. Colorado, New Mexico, Kansas, and Oklahoma support populations of Gurney's yucca . 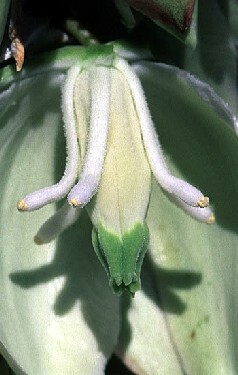 The Flora of North America provides a distributional map of soapweed yucca. Distributional maps for narrowleaf and Gurney's yucca can be found on Plants database. Throughout its range in Colorado soapweed yucca can often be found in plains grasslands in association with blue grama (Bouteloua gracilis) [32,96,105,121], needle-and-thread grass (Hesperostipa comata) [32,105], and in a variety of sagebrush (Artemisia spp.) communities including Bigelow sagebrush (Artemisia bigelovii)  and mountain big sagebrush (A. tridentata var. vaseyana) . In 1906 it was reported as one of the most prominent plants in the region east of Pike's Peak and could be found alongside horned spurge (Euphorbia brachycera), mountain bladderpod (Lesquerella montana), nylon hedgehog cactus (Echinocereus viridiflorus), and prairie bluebells (Mertensia lanceolata var. lanceolata) in what was termed the "Yucca glauca society" . It is often found among sandhill communities with prairie sandreed (Calamovilfa longifolia), sand sagebrush (Artemisia filifolia), and sandhill muhly (Muhlenbergia pungens) . In the central Rocky Mountains of Colorado soapweed yucca is found in areas dominated by interior ponderosa pine (Pinus ponderosa var. scopulorum). Other shrubs include fivepetal cliffbush (Jamesia americana), common juniper (Juniperus communis), bearberry (Arctostaphylos uva-ursi), wax currant (Ribes cereum), shrubby cinquefoil (Dasiphora floribunda), and Wood's rose (Rosa woodsii) . Along the Colorado Front Range it is associated with the New Mexico feathergrass (Hesperostipa neomexicana) community, where it is present with purple threeawn (Aristida purpurea), foothill milkvetch (Astragalus tridactylicus), Front Range twinpod (Physaria bellii), and shortstem buckwheat (Eriogonum brevicaule) . Soapweed yucca is also found in tree cholla (Opuntia imbricata) associations with blue grama, sand dropseed (Sporobolus cryptandrus), and ring muhly (Muhlenbergia torreyi) , and in Colorado pinyon-juniper (Pinus edulis-Juniperus spp.) dominated systems . Throughout Kansas soapweed yucca can be found with prairie graminoids such as little bluestem (Schizachyrium scoparium), blue grama, and needle-and-thread grass. Shrub associates include sand sagebrush and fourwing saltbush (Atriplex canescens) . Soapweed yucca is found with velvetweed (Gaura mollis), nineanther prairie clover (Dalea enneandra), and hairy grama (Bouteloua hirsuta) in shortgrass prairie habitats  and with little bluestem, big bluestem (Andropogon gerardii var. gerardii), purple prairie clover (Dalea purpurea), azure blue sage (Salvia azurea), and western ragweed (Ambrosia psilostachya) in tallgrass prairie habitats . Soapweed yucca is associated with open, dry habitat types in Montana. It occurs in interior ponderosa pine and limber pine (Pinus flexilis) stands with blue grama, sideoats grama (Bouteloua curtipendula), and plains prickly-pear (Opuntia polyacantha) , and can be found with skunkbush sumac (Rhus trilobata) and creeping juniper (Juniperus horizontalis) in the interior ponderosa pine/bluebunch wheatgrass (Pseudoroegneria spicata) vegetation type . In the badlands of southeastern Montana, soapweed yucca is found with greatest frequency in the mountain big sagebrush-western wheatgrass (Pascopyrum smithii) community type and greatest abundance in the skunkbush sumac-western wheatgrass community type . Soapweed yucca is found throughout most of Nebraska and is important for the ground coverage it provides in the Nebraska sandhill range . It is commonly associated with sandy substrates, occurring on blowouts with sand bluestem (Andropogon gerardii var. paucipilus) and little bluestem , and on dune ridges and upper slopes with stiff sunflower (Helianthus pauciflorus), leadplant (Amorpha canescens), prairie rose (Rosa arkansana) , western sandcherry (Prunus pumila var. besseyi), and manystem pea (Lathyrus polymorphus) . Soapweed yucca is found with western snowberry (Symphoricarpos occidentalis) and skunkbush sumac  on scattered and open woodlands and with blue grama, threadleaf sedge (Carex filifolia), and western wheatgrass in mixed-prairie habitat types . In the high plains of Nebraska, soapweed yucca was found on 8 out of 9 surveyed plots. Relative abundance of soapweed yucca was highest on isolated canyon slopes, where it could be found with Rocky Mountain juniper (Juniperus scopulorum), eastern redcedar (Juniperus virginiana), and little bluestem. Soapweed yucca was also found on sand talus with big bluestem, little bluestem, needle-and-thread grass, and sagebrush (Artemisia spp.) . In the middle Rio Grande valley of New Mexico, soapweed yucca occurs with soaptree yucca, tree cholla, and broom snakeweed (Gutierrezia sarothrae). Grasses in these desert grassland plant communities include black grama (Bouteloua eriopoda), big galleta (Pleuraphis rigida), burrograss (Scleropogon brevifolius), and threeawns (Aristida spp.) . In the shrub-grassland areas, soapweed yucca occurs with velvet mesquite (Prosopis velutina), broom snakeweed, and sand shinnery oak (Quercus havardii). In the desert grasslands of northeastern New Mexico it is found primarily with blue grama, sideoats grama, and galleta (Pleuraphis jamesii) . 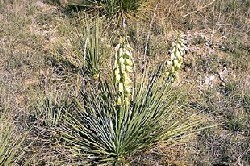 Throughout its distribution in Texas, soapweed yucca is broadly associated with sand sagebrush and prickly-pear (Opuntia spp.) [9,154,155] and can also be found with redberry juniper (Juniperus erythrocarpa), Ashe juniper (J. ashei), sideoats grama, hairy grama, and blue grama . It occurs with honey mesquite (Prosopis glandulosa), catclaw acacia (Acacia greggii), wait-a-minute (Mimosa aculeaticarpa var. biuncifera), and lotebush (Ziziphus obtusifolia) , and can reach densities exceeding 2,000 plants per acre on the panhandle of northern Texas . Its occurrence in western Texas is not significantly (P<0.05) affected by the occurrence of Pinchot juniper (Juniperus pinchotii) . In western Missouri soapweed yucca is found in prairie habitats with hairy grama, blue grama, large beardtongue (Penstemon grandiflorus), and downy paintbrush (Castilleja sessiliflora) . In western Iowa it occurs with little bluestem, big bluestem, and purple coneflower (Echinacea angustifolia) . Soapweed yucca can be found on east-facing slopes of the Big Horn mountains of Wyoming with little bluestem and bluebunch wheatgrass . It can be found in the Powder River Basin with Wyoming big sagebrush (Artemisia tridentata var. wyomingensis), western wheatgrass, blue grama, and birdfoot sagebrush (Artemisia pedatifida) . Soapweed yucca is often found with blue grama and sagebrush, with highest coverage and constancy percentages in shrub-steppe vegetation types . At the Great Sand Dunes National Monument, it was found on 21% of research plots located on active and stabilized dunes . Soapweed yucca is found with Rocky Mountain juniper and Colorado pinyon in juniper-pinyon woodlands that occur throughout the Great Basin. Other associates include Stansbury cliffrose (Purshia mexicana var. stansburiana), Apache-plume (Fallugia paradoxa), green ephedra (Ephedra viridis), Fremont's mahonia (Mahonia fremontii), fourwing saltbush, and banana yucca (Yucca baccata) . In the Great Basin grasslands soapweed yucca is found with sacahuista (Nolina microcarpa), skunkbush sumac, wait-a-minute, and fourwing saltbush . Shrubs such as soapweed yucca, fourwing saltbush, winterfat (Krascheninnikovia lanata), prairie sumac (Rhus copallinum var. lanceolata), rabbitbrush (Chrysothamnus spp. ), and snakeweed (Gutierrezia spp.) are scattered throughout the plains grasslands. In areas subjected to heavy grazing, soapweed yucca is found with honey mesquite, sand shinnery oak, and sand sagebrush . In the northern prairie wetlands region it can be found on blowouts with sand bluestem, hairy grama, and needle-and-thread grass in areas where there is no contact with the water table . This description provides characteristics that may be relevant to fire ecology, and is not meant for identification. Keys for identification are available (e.g., [57,91,137]). Soapweed yucca is a native evergreen shrub  that grows to 3 feet (1 m) in height . It supports short, branching, decumbent stems  and a taproot [142,143]. Root systems greater than 20 feet (6 m) in depth were reported in eastern Colorado . Lateral roots extend 20 to 30 feet (6-9 m) . Soapweed yucca supports 1 or 2 large diameter rhizomes from which a network of smaller oblique rhizomes protrude, forming a mat 4 to 24 inches (10 to 60 cm) below the soil surface . Soapweed yucca has simple, concave, alternate leaves with coarse fibers along the margins and a sharp apex . Leaf size ranges from 8 to 40 inches (20-100 cm) in length and 0.2 to 0.5 inch (0.6-1.2 cm) in width . Leaves emerge from a woody caudex  and are situated at a steep angle that allows year-round photosynthesis . Stomatal conductance and net photosynthesis are adapted to function at optimal capacity under given temperatures . The appearance of the leaf head of soapweed yucca is contingent upon its age and available rainfall . Soapweed yucca has a raceme inflorescence  that is nearly sessile, 12 to 80 inches (30-200 cm) in length , and composed of 25 to 30 drooping flowers . Fruits are oblong, dehiscent, erect, and approximately 1.2 inch (3 cm) in length . Soapweed yucca flowers house a single style and 6 stamens . Seeds are glossy , and grow to 9 × 12 mm . Soapweed yucca reproduces by seed  and rhizomes . The rates at which soapweed yucca can reproduce through rhizomes is likely dependant upon mechanisms such as rates of branching, rhizome length, and the number of rhizomes. Soapweed yucca rhizomes form from the seedling rhizome in a rebranching pattern, spreading horizontally. After 4 to 6 years, buds grow above the rhizomes and produce leaves after reaching the soil surface. Connections with the mother plant eventually become dormant and decay . In a study conducted on cloned soapweed yucca plants, total number of flowering days was not an indication of reproductive success and was less important than the time at which flowering occurs. It was also beneficial for the plant to have branched flower stalks for reproductive success . Pollination: Pollination of soapweed yucca is dependent upon the yucca moth (Pronuba yuccasella)  or other pollinating insects such as small flies (Pseudocalliope spp.) . The yucca moth transfers pollen from the anther, depositing it deep into the style and leading to the production of many seeds, some of which are fed upon by the larvae . 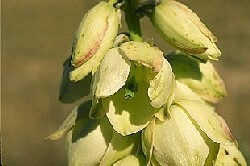 The number of yucca moths available for pollination is related to the abundance of open flowers . Soapweed yucca benefits from wood ants (Formica spp.). They are natural predators of the nonpollinating yucca moth (Tegeticula corruptrix), which feeds on soapweed yucca seeds while in the larval stage . Breeding system: Moth pollination  assures that soapweed yucca is mostly outcrossing. Anthers are remote from the cavity encapsulated stigma and sticky pollen , assuring that autogamous pollination of soapweed yucca is rare. Pollen is viable for a minimum of 4 days, as are the flowers. Autogamous pollination occurs as the flower begins to wilt and stamens come into direct contact with the stigma . Seed production: The number of viable soapweed yucca seeds is dependant upon the transfer of high quality pollen, sufficient resources for development, and ovules that are not damaged by the insertion of the yucca moth's ovipositor during the transfer of pollen . It can take several years for rosettes to bloom . Despite the high number of seeds consumed by moth larvae, large numbers are left unharmed for dispersal . In a study to determine the relationship between soapweed yucca and the yucca moth, 124 plants with a mean of 291 ovules per plant had 138 viable seeds after consumption by adult and larval yucca moths. The maximum number of larvae per fruit was 19 . In Colorado, the number of surviving seeds increased with elevation despite fewer fruits. This was likely due to decreased predation by the yucca moth, which prefers the warmer temperatures of the Great Plains over those experienced at higher elevations . Seed dispersal: Seed pods become erect and split longitudinally, exposing seeds to dispersal by wind and gravity . Seed banking: Laboratory studies exploring germination rates of soapweed yucca suggest that seed banking is likely [38,149,160]. Further research is needed to determine longevity and viability of soapweed yucca seeds in a field setting. Germination: Soapweed yucca experiences higher rates of germination when stratified. In a laboratory setting soapweed yucca successfully germinated under a variety of stratification treatments. Following 1 to 3 months of stratification, germination occurred after exposing seed to a constant 70 ºF (20 ºC) or alternating temperatures between 70 ºF (20 ºC) and 40 ºF (5 ºC). Germination also occurred after seed was stored at 40 ºF (4 ºC) and then exposed to 70 ºF (20 ºC) temperatures. A maximum of 27% of seeds germinated after being exposed to 90 ºF (30 ºC) or by alternating 90 ºF (30 ºC) and 70 ºF (20 ºC). Sixty-seven percent germination was achieved at 50 ºF (10 ºC) with 3 months stratification. The highest germination rates (91%) were experienced when 4-month-old seed was dry stored at 70 ºF (20 ºC) and then wet treated for 3 months at 70 ºF (20 ºC). Six days were required for 50% germination. See Emerson  for further seed germination information. A study on the germination of Nebraska sandhill plants revealed 67.1% germination rates for soapweed yucca seed that had been dry stored, 44% germination for seeds vernalized for 1 month, and 86.6% germination for seeds vernalized for 2 months. Seed vernalized for 3 months sprouted while in storage under winter temperatures . Soapweed yucca germinated in 4 days after being soaked in water for 24 hours and kept at temperatures between 80 ºF and 90 ºF (28 ºC and 32 ºC) in moist cotton . Seeds from low-elevation soapweed yucca plants are thought to have stronger tendencies towards dormancy than those found at high elevations . Seedling establishment/growth: Reproduction of soapweed yucca by seed is limited to the percentage of viable seeds remaining after seed predation by larvae. Soapweed yucca had the highest number of seedlings of 19 observed yucca species over a 4-year period, with 72 seedlings observed . Soapweed yucca seedlings have reduced growth rates compared to ramets. Seedlings are important for colonizing new sites, after which clones take over as primary reproducers. As the carrying capacity is reached, seed production increases in order that new populations may emerge outside the range of vegetative reproduction. The ratio of seedlings produced vegetatively versus those produced by seed varies across populations . Asexual regeneration: Soapweed yucca reproduces vegetatively through sprouting from the caudex and from horizontal rhizomes [38,160], which yield rosette-baring offshoots . Projecting from the upper portion of one or two large diameter rhizomes are horizontal branches forming a netlike pattern from which sprouts emerge. Depriving the plant of shoots through fire or mechanical means results in regeneration rates that equal or exceed previous regeneration rates within a year or 2. In a study to confirm successful vegetative propagation, sprouts were separated from the mother plant by removing 2- to 4-inch (5-10 cm) sections of rhizome while in the field. Normal growth of the sprouts continued during the following year . Vegetative reproduction can be stimulated after top-kill of soapweed yucca . Climate/topography: Soapweed yucca is adapted to a wide range of environments. Average daily and annual variations in temperature can be great, such as in the deserts of New Mexico . Air temperatures can drop to -44 ºF (-42 ºC) during winter months, and escalate to 106 ºF (41 ºC) in the summer. Yearly precipitation averages range from a low of 1.2 to 1.6 inches (300-400 mm) in Wyoming  to a high of 24.0 inches (610 mm) in Texas . Humidity levels in Wyoming are at least 25% during July and August  while on the east slope of the Colorado Front Range, mean annual relative humidity is 69% . Topography includes hills, plains [61,107], bluffs [69,83], rocky outcrops and ridges , and areas of shifting sands . Soils: Soapweed yucca is most commonly found on sandy sites [27,32,65,134] or rocky areas with coarse-textured soils [43,146,161]. In the Great Plains it is associated with limestone soils [71,137] and alluvial terraces . In New Mexico soapweed yucca is found in sandy soils underlain by caliche . Soils in Texas are relatively deep clays or clay loams . On the Colorado Front Range, soil pH is approximately 8.0 to 8.2 . Soapweed yucca does best in well-drained soils with sunny exposures . Soapweed yucca occurs in all stages of succession [76,125]. In a blowout that occurred in eastern Colorado, vegetational succession data revealed that soapweed yucca returns during stage 4 of a 6-stage process. Sandhill muhly was the primary species to return before soapweed yucca. Once it became established, soapweed yucca persisted on the site . Soapweed yucca can be found on undisturbed sites  and sites affected by land management activities  such as plowing . It is a late-seral species on sandy range sites and in grassland associations (50% cover) in Montana . In southeastern Montana, soapweed yucca is considered an understory species in the interior ponderosa pine/skunkbush sumac vegetation type , indicating possible shade tolerance. It also occurs on open sites . Soapweed yucca flowers in May and June in New Mexico  and May through July in the Great Plains region . The fruit ripens in July and August, and seed disperses in September . Ramets are produced from lateral buds or rhizomes near rosettes that have senesced in late summer . Fire adaptations: Despite immediate adverse effects of fire on soapweed yucca , populations recover from fire [60,160]. Extensive rhizomatous mats 4 to 24 inches (10-60 cm) below the soil surface  are likely protected from fire damage. Vegetative reproduction (sprouting from the caudex and rhizomes) can be stimulated when soapweed yucca is top-killed . Documented sprouting from the caudex after cutting  suggests that soapweed yucca can sprout following top-kill by low- to moderate-severity fire. Recently disturbed sites provide an opportunity for soapweed to germinate; however, germination rates of soapweed yucca seed decreased after being exposed to high temperatures (180-250 ºF (80-120 ºC)) in a laboratory setting . This suggests that on-site seeds require burial in the seed bank in order to germinate following fire. Wind and gravity dispersal  of off-site seed sources is also possible after fire. Further research is needed to explore fire adaptations of soapweed yucca. Fire regimes: Soapweed yucca is primarily associated with grassland environments. Historical fire return intervals within these vegetation types were probably dependant upon drought cycles, the prevalence of lightning strikes, and anthropogenic uses. Soapweed yucca is primarily found throughout ecosystems characterized by fire return intervals of less than 35 years . Where fire has been excluded from sagebrush communities and desert grasslands, invasion of nonnative annual grasses such as red brome (Bromus madritensis ssp. rubens), lovegrass (Eragrostis spp. ), and cheatgrass (Bromus tectorum) has often occurred, enhancing the potential for fires to start and spread, and increasing fire frequency [14,28,164,169]. Fire return intervals have also been reduced as a result of overgrazing which can lead to dense overstories forming closed canopies that carry fire more efficiently. Exotic annual grasses are likely to invade these sites if a seed source is available . The following table provides fire return intervals for plant communities and ecosystems where soapweed yucca is important. Find further fire regime information for the plant communities in which this species may occur by entering the species name in the FEIS home page under "Find Fire Regimes". Soapweed yucca can suffer adverse effects from fire . It is likely that sustained surface fires top-kill soapweed yucca while underground structures survive. Reduced germination rates of seed exposed to increasing temperatures in a laboratory setting  indicate soapweed yucca is unlikely to regenerate from seed following a sustained, high-temperature fire, but that seed will survive lower temperatures of short duration, such as those typical of grass fires. Soapweed yucca populations were reduced by 13% after burning with a propane torch in a study to determine the effects of burning, shredding, and herbicide treatments. Surface fire temperatures simulated those previously recorded for combustion of fine fuel loads of 5,400 lb/ac . Wright and Bailey  report that Yucca spp. are weak sprouters after fire, but are able to hold their position in plant communities due to sprouting ability. As a result of burning with a propane plant burner, soapweed yucca suffered an 85% reduction in total biomass and sent out an average of 1.5 new shoots per plant at postfire month 18 . Observations suggest that when damage from a burn is too great or rodent populations too high, soapweed yucca is not able to recover . Populations in the Nebraska sandhills prairie declined as a result of wildfires in late spring . Soapweed yucca seeds gathered from the Texas-Oklahoma border were exposed to heat treatments in a laboratory setting. Results indicate that soapweed yucca seeds are susceptible to heat and may not provide a viable regeneration source if exposed to temperatures over 250 ºF (120 ºC) . Soapweed yucca populations have been observed recovering from fire . After a prescribed burn in sand shinnery oak communities in Oklahoma, frequency and occurrence of soapweed yucca was 0.41% and 0.08% after the 1st postfire growing season, 0.12% and 0.12% after the 2nd postfire growing season, 0.40% and 0.40% after the 3rd postfire growing season, and 0.82% and 0.40% after the 4th postfire growing season. No significant differences were noted in shrub species composition after the prescribed burn (P=0.55) . Due to a system of netlike rhizomatous branches protected from the effects of heat by overlaying soil , fire will not likely eliminate soapweed yucca. Seeds that were exposed to temperatures of 230 ºF (110 ºC) and 250 ºF (120 ºC) for 5 minutes in a laboratory setting experienced 28% and 3% germination rates, respectively . This may indicate that soapweed yucca establishment from on-site, soil-stored seed is possible except following fires of longer duration and/or higher temperatures. In order to circumvent adverse effects to the prairie-obligate skipper butterfly, land managers in western Iowa should consider the extent of butterfly habitat in the Loess Hill prairies prior to conducting prescribed burns . Soapweed yucca is utilized by a variety of mammals, primarily during drought years when more desirable forage is not available. Livestock and big game browse flower and seedlings when accessible [107,165]. Cattle prefer the fleshy parts of the plant and can decrease soapweed yucca populations if allowed access to a single site for multiple years . Soapweed yucca is considered poor forage for cattle by some . It can be used as a feed supplement during severe drought years and will return after extensive harvest . On the shortgrass ranges of Colorado, cattle feces revealed that soapweed yucca consumption was highest in April and August . Mule deer consume soapweed yucca throughout the year  with heaviest use in spring . Rumen samples in prairie habitat indicate consumption in summer, winter, and spring months . In New Mexico, soapweed yucca makes up 0% to 3% of mule deer diets , accounting for 0.5% of their overall diet . Bighorn sheep consume soapweed yucca in North Dakota  and the Colorado Rockies, where soapweed yucca constitutes an average of 5.3% of their diet . Soapweed yucca is also utilized by mule deer in South Dakota , white-tailed deer in Montana , pronghorn [117,142], and bison . Soapweed yucca provides food, shade, and nesting sites for birds and small mammals . Seeds are an important food source to small mammals , and leaves are consumed during times of drought and snow [122,142]. Black-tailed jackrabbits in Colorado and Kansas and white-tailed jackrabbits in Colorado utilize soapweed yucca as a food source . Soapweed yucca is used by the southern plains woodrat as construction material for houses built to shelter nests and store food . It is found in areas that support cotton rat populations in New Mexico . Palatability/nutritional value: A plant composition analysis was conducted on soapweed yucca in South Dakota. Moisture content throughout the year varied with 4 samples, from 55.7%-64.7%. Carotene had ranges of 18.0-43.5 mg/g, ash ranged from 1.5%-1.9%, crude fat from 0.73%-1.3%, crude protein from 3.6%-4.8%, and crude fiber from 14.6%-16.0% . The average percentage of crude fiber, ash, and protein as measured in leaves from soapweed yucca plants in New Mexico was 42.3%, 4.86%, and 5.57%, respectively . A study conducted in eastern Colorado to determine the effect of geologic refuges on the occurrence of species found that areas inaccessible to cattle supported 1.96% soapweed yucca cover as opposed to 1.45% in browsed areas. Soapweed yucca was listed as having relatively low palatability with the potential to become more palatable at different times in the season . The use of soapweed yucca for disturbed site rehabilitation has yielded varying results. Soapweed yucca is considered a "common plant" by the USDA Natural Resource Conservation Service and can be purchased from suppliers for conservation purposes . It responds favorably to propagation, experiencing shoot proliferation and rooting from explants of the shoot tip, flower bud, and rhizome . Instructions on producing soapweed yucca as container seedlings can be found in . Soapweed yucca seeds obtained from mid-October through early spring were used for reclamation in southeastern Montana. Seeds were harvested from dehiscent capsules while they were still intact or after being dried. Best results were obtained from seed stored at 40 ºF (4 ºC) over winter and planted in spring and seed planted immediately after being collected in the fall . On previously mined land in southeastern Montana, reseeding occurred with either 4-species or 16-species mixtures to determine rates of perennial plant regeneration under various treatments. Soapweed yucca returned to plots seeded with the 4-species mixture at a density of 0.3 plant/m² 5 years after seeding, and did not return on plots seeded with the 16-species mixture. For additional information on methods utilized in this project see . Of 28 soapweed yucca plants planted in 1988 on a prairie reconstruction site in Kansas, 79% survived the 1st year and 64% survived the 2nd year. None of the plants flowered within that 2-year period. Of 19 plants planted in 1985, 100% survived the 1st year. No record was made beyond 1986 . Viable soapweed yucca seeds are black. Seeds with a white seed coat lack an endosperm and are not viable . Soapweed yucca has been utilized by Native Americans for nearly 10,000 years . Both the fruiting portion and flower stalks are consumed [15,29,30,143], and various plant parts are processed for medicinal uses [62,153]. Soapweed yucca is also used to produce items such as paper , rope, baskets, brushes, soaps [15,143], dyes, poison for arrows , and sticks for fire . The response of soapweed yucca to browsing is variable. Reports have been made of its increases [27,81,143] and decreases [21,71,85] following grazing practices. The amount of soapweed yucca consumed by cows in eastern Montana was influenced by pregnancy . Eradication of soapweed yucca from rangelands in favor of more palatable species has been achieved through various methods. One study found repeated aerial applications of the herbicide silvex controlled soapweed yucca , while another achieved control through the burning or cutting of plant tops in combination with the use of tebuthiuron, picloram, and 2,4,5-T  (2,4,5-T is now banned by the E.P.A. ). Grazing forage was increased by 37% and soil water content significantly reduced (P=0.05) on a site where chemical control of soapweed yucca was achieved . Soapweed yucca populations increased significantly (P<0.05) after aboveground portions were crushed by off-road vehicles, and the plants sprouted from belowground portions . Fluoride and sulfur from coal-fired plant emissions could have adverse effects on soapweed yucca, but damage to plants would likely not be detected prior to overstory effects such as reduced needle length and tissue necrosis . When inoculated with mycorrhizae in a laboratory setting, the mean dry mass of inoculated soapweed yucca plants was 87% greater than nonmycorrhizal control plants .